Press 'Start' button on Jubito server application, or, if you're using the CLI, type judo server start (judo API). By default web server triggered automatically when it runs. Next, open a web browser and visit the default localhost address as described above. You can now start using the web interface. UPDATE: Jubito supports a GUI for most settings. Of course you can do modifications by editing the configuration file. In the main directory you'll find the AppConfig.xml file that holds all the information that Jubito needs to be functional. 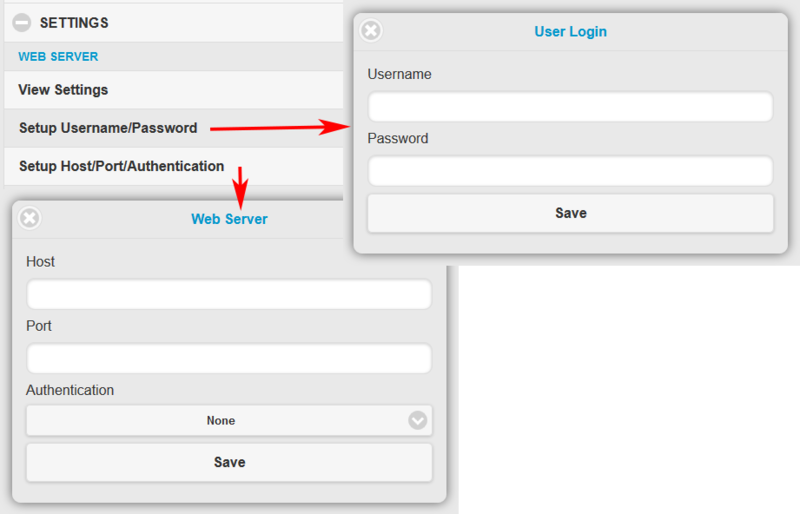 In this topic we'll explain the web server settings. First edit the AppConfig.xml with your favorite editor and jump to the system settings. Enter a hostname, IP address or a dynamic dns if you want to have access over the internet, as also an http port. You can change the port if you already use the default 8080. When you finish save and close the file. Now run Jubito server and press the Start button. Open a browser and enter the address that consist from the hostname, port and the root directory which is by default the www (e.g. : http://hostname:port/www/index.html). Default credentials is admin:admin which you can change by following these instructions. Now you are ready to use Jubito! The above process is not working in my ubuntu 16.04. What exactly not working? Please be more specific. The first screenshot in this post is self explained. I get an error stating "This site can't be teached, myserv's server DNS address could not be found"
The address entered in the Hostname line was setup in the tcp/ip 4 DNS server address settings. I want control over the Internet so dynamic DNS settings comes to mind. This doesn't look like a valid address (myserv.208.67.222.222.co.za) but if it is, then this is not the correct address to reach myserve:8080/www/index.html but myserv.208.67.222.222.co.za:8080/www/index.html. However I still think that the address you use is incorrect. Have you ever use DDNS before? Can you please provide the exact address or the provider you use? You can try open an account at noip.com, this is what I use. Also you should configure your router to redirect the IP of machine Jubito runs as well the port. To answer your questions, no I have never used DDNS before until now. I opened an account at noip.com. For example purposes I created a host name being philsserver. The given host on noip is now: "philsserver.hopto.org. I entered this host name in the AppConfig.xml and kept the port as 8080. I understand that I should configure the router to do port forwarding for the device I want to setup as a server. I will attempt this as soon as I can. I tried connecting to philsserver.hopto.org:8080/www/index.html. I now get the error: "philsserver.hopto.org refused to connect". Am I right to assume this is because I did not configure the port forwarding on the router? There is no need to thank me, I'm glad when I'm helpful. Yes, concerning Jubito, the steps you're describing, are correct. Find the router model and check if it supports noip and then try to set it up. If I can give you any additional help, please do not hesitate to write it up, or send me a message via contact form. i to am having problems geting the weberver to work. i love this idea and it fits with my tinkering!! Also don't forget in windows to run Jubito as administrator. Thanks for your help. I have given up on this and was really wanting it to work. Love the idea just not working with any settings. No problem. In case you change your mind drop me a message from contact form to give you further assistance. Copyright © 2017 J@mBeL.net. Powered by Blogger.